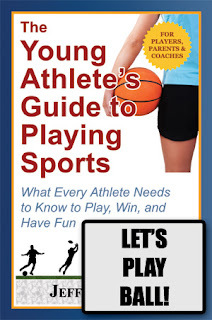 Over the next few months, I will post excerpts from my new book, The Young Athlete's Guide to Playing Sports. The first topic is from chapter 1, Let's Play Ball!, and discusses how to use your peripheral vision to more fully see all of the action around you. To track both the action around the ball and player movements away from the ball, you sometimes need to quickly turn your head back and forth. This is especially true when the ball and players of interest are not all in front of you. But when all of the action is within your field of view, a more effective technique is to use your peripheral vision. This is the part of vision that occurs outside the very center of your gaze, and extends to the edges of your field of view. When using your peripheral vision, you never lose sight of a potentially key event (unlike turning your head back and forth). You can track all of the action all of the time. By seeing both the action around the ball and your opponent, you can anticipate and react quicker to play better defense. Similarly, on offense, you can recognize passing and scoring opportunities without having to look directly at your teammates. You can see a teammate off to your side cutting toward the goal, even as you attack your defender. How do you use your peripheral vision? Instead of focusing your line of sight directly on one player (or the ball), look in a direction that is half-way between two players. Although you will not see either player clearly, you can still recognize their movements. And this is the key information you need to react. Depending on the relative importance of each player (and how close they are to the edges of your field of view), you can also shift your line of sight slightly one way or the other. To become more aware of your peripheral vision, try this simple exercise. Extend both of your arms fully outward to your sides at eye level and wiggle your fingers. While focusing on an object in front of you, slowly move your arms forward until you begin to see your fingers. Notice that you only see the movement of your fingers—everything else has no clear shape! You can move your hands forward and backward to explore the edges of your field of view and increase your awareness of this type of vision. Although the above diagram illustrates how the defender uses his peripheral vision, consider how the same approach is used by the attacking player with the ball. 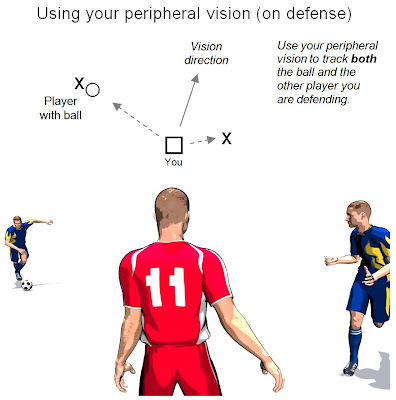 As he moves forward, he is primarily looking at the defender while also using his peripheral vision to track both the ball and the position of his teammate on the opposite side. Finally, using your peripheral vision not only helps improve your play, but also prevents injury. Keeping your head up, “on a swivel” (moving your head back and forth), and actively using your peripheral vision, all help you anticipate events before they happen. By recognizing approaching players and objects early, you can react more quickly to avoid dangerous collisions.